Are you working on your to do list for your Amsterdam visit? Then be sure to write down to do a boat trip on the canals of Amsterdam. Some of the museums or other sightseeings are within a walking distance in the city center. But if you want to go a bit further than the city center ánd discover all about the history of the city.. Then doing a boat trip is the answer! 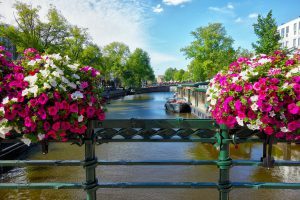 Amsterdam has a long history when it comes to water, canals and life in this city. The first canals were build in 1250. Their main job was to eliminate intruders and to get more grip on the water. When they build a citywall after that, the canals became unimportant they thought. Until they saw that the structure of the canals can actually be very handy when trading with other people.. They started building packaging houses near the canals to serve the trade. A true import and export city was born! It became one of the most important gateways in Europe. The nice thing about this period is that it has left it’s trademark throughout the city nowadays. The beautiful old buildings are still standing along the canals. And only by looking at them you go back in time. A lot of the houses are preserved and restored and almost every house has a story to tell. The perfect way to tell all those stories, is by a guide on a boat trip. This is the ideal way of looking at the city from a different perspective while receiving a lot of information you probably didn’t know about. In Amsterdam you can find a lot of boat companies that offer boat trips on the canals of Amsterdam. Be sure to take a boat trip! You can go for a hop on hop off boat, a regular boat trip taking about two hours through the city center. Want to make it more special? Take a boat trip at night with dinner included. You can enjoy your pizza or hamburger with friends while enjoying the beautiful view on the city. This really gives you an idea of what the city looks like at night. Also perfect for a romantic dinner for two!